​This beautiful icon of Our Lady of Częstochowa has graced St. Hedwig’s Church since 1941. The following is some of the history. “For more than half a century, she has held a place at St. Hedwig Church and in the hearts of the Polish-American parishioners who worship there. She is the Black Madonna. A splendid reproduction of Poland’s most revered icon of Mary and the Child Jesus hangs with stately majesty over the Blessed Virgin’s altar at the east Erie church. 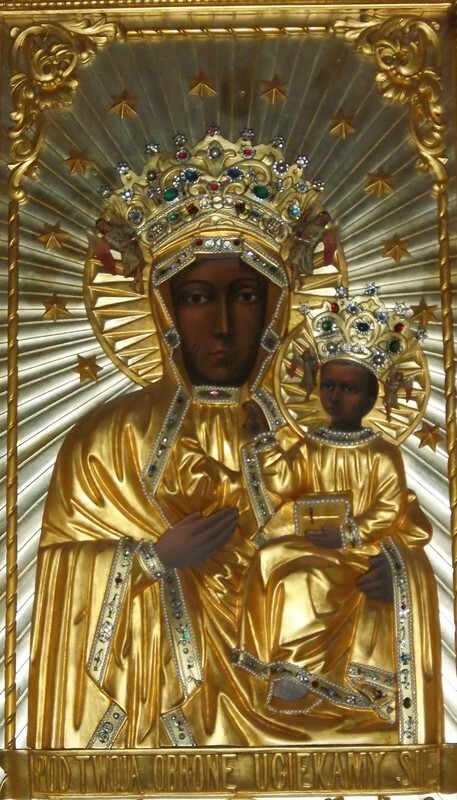 The Black Madonna at St. Hedwig’s has its roots in Częstochowa. In fact, it was created there. Father Kozlowski said the late Msgr. Francis Robaczewski, the founding pastor of St. Hedwig’s knew a Vincentian priest who had connections with a talented artist in Częstochowa. Arrangements were made and the artist was commissioned to do the work. Other sources have said that the jewels and stones surrounding Our Lady of Częstochowa were given from the rings and jewelry of the Parishioners. For More on the story of Our Lady of Częstochowa Click on this link from the Polish American Journal.